We’d love your help. Let us know what’s wrong with this preview of Two Truths and a Lie by Ammi-Joan Paquette. Two Truths and a Lie is the first book in a new series that presents some of the most crazy-but-true stories about the living world as well as a handful of stories that are too crazy to be true—and asks readers to separate facts from fakes! Did you know that there is a fungus that can control the mind of an ant and make it do its bidding? 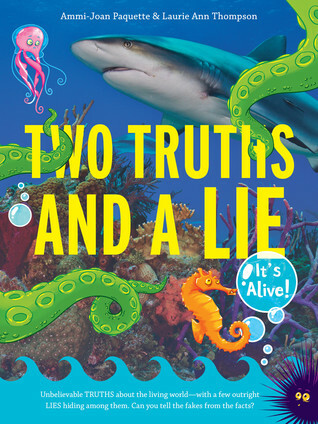 Would you believe there is such a Two Truths and a Lie is the first book in a new series that presents some of the most crazy-but-true stories about the living world as well as a handful of stories that are too crazy to be true—and asks readers to separate facts from fakes! Did you know that there is a fungus that can control the mind of an ant and make it do its bidding? Would you believe there is such a thing as a corpse flower—a ten-foot-tall plant with a blossom that smells like a zombie? How about a species of octopus that doesn’t live in water but rather lurks in trees in the Pacific Northwest? To ask other readers questions about Two Truths and a Lie, please sign up. Fantastic format! Kids in grade 4 and up will enjoy picking which story of 3 is false! 9 phenomenal chapters and 3 stories in each one! The only thing that made me sad was when I reached the end! Educators can use this book as a mentor text for student writing their own informational texts! Fascinating facts, and wait, false facts? Yet those un-truths are hard to figure out in this book! This book is sure to amaze readers and will be a fantastic mentor text for teachers when discussing how to sift through research and fact check what is written. Each chapter in this book contains three stories - two that are factual and one that's made up but written to sound like it's also factual. The book challenges kids to read the stories in each chapter, guess, and then do their own research to find out which stories are true and which is the fake. There's a section on how to research and find reliable sources and then at the end of the book it gives you the answers and a bibliography for each chapter. This book is not only fun browsing material f Each chapter in this book contains three stories - two that are factual and one that's made up but written to sound like it's also factual. The book challenges kids to read the stories in each chapter, guess, and then do their own research to find out which stories are true and which is the fake. There's a section on how to research and find reliable sources and then at the end of the book it gives you the answers and a bibliography for each chapter. This book is not only fun browsing material for kids who love learning interesting facts, but it has great potential for classroom or library lessons on information literacy. Share the stories from a chapter and challenge students to use research to provide which stories are true. Since the fake stories are written to look just like the true stories (with photos, defined glossary words, captions, diagrams, etc. ), this is a great book for showing students that you have to double check sources and you can't believe everything you read! What I liked: This book is so MUCH fun to read. Filled with completely ridiculous, yet true stories, this book will teach you about miraculous plants and animals. At least most of the stories are true. For every three stories, there is one fabrication. As we read we have to think about and research the stories to find out the read truth. This book encourages research and figuring out the difference between fact and fiction on the in I received a copy of this book in exchange for an honest review. What I liked: This book is so MUCH fun to read. Filled with completely ridiculous, yet true stories, this book will teach you about miraculous plants and animals. At least most of the stories are true. For every three stories, there is one fabrication. As we read we have to think about and research the stories to find out the read truth. This book encourages research and figuring out the difference between fact and fiction on the internet. I think kids will find it engaging and incredibly fun to read. The book is well written. I highly recommend it for any curious human being. I'd love to talk about this book with intermediate and middle school teachers. The title sets kids up for questioning right from the start. 1.) I think it is the kind of books that some readers will love from start to finish, so it should be on your bookshelf. 2.) I think it could be used as a challenge in a classroom to uncover fake news. 3.) Parts of me wish that the last chapter was the first chapter - but, knowing that I can share that first and issue the challenge. 4.) I wonder if some of t I'd love to talk about this book with intermediate and middle school teachers. The title sets kids up for questioning right from the start. 1.) I think it is the kind of books that some readers will love from start to finish, so it should be on your bookshelf. 2.) I think it could be used as a challenge in a classroom to uncover fake news. 3.) Parts of me wish that the last chapter was the first chapter - but, knowing that I can share that first and issue the challenge. 4.) I wonder if some of the chapters should be presented in their online form so kids can make the connection with the need to read for understanding rather than fact in all places. Highly engaging informational book that presents three unusual stories about plants and animals around the world, but only two of them are true! Two things I loved: that the authors want readers to go and research to find the truths (or lies) for themselves. The research guide gives them tips on how to spot “fake news,” where to go to find reliable sources, and when to use common sense. The world needs this now. The second thing was the book’s structure: organized in three parts (plants, animals, Highly engaging informational book that presents three unusual stories about plants and animals around the world, but only two of them are true! Such a great idea, and so perfectly executed. My family loved reading this book aloud and debating which stories we thought were true or false. The pictures are terrific, too--they really make you think about the nature of evidence and authority and how fake stories can be made to look quite real. I'm so glad this is going to be a series--can't wait for the next volume! What a great idea! Each story is interesting, and it's not always so easy to tell which of the three stories in each chapter is false. Paquette has written an engaging book that challenges the reader on a number of levels. I very much look forward to reading future books in this series. Loved reading this with my kids. They thought it was hilarious and we spent a lot of time researching the items in the book together. I always end up researching the non-fiction I read, so this book is right up my alley. It would be a great title for a class on research techniques as well. I’m not sure about this one. Two Truths and a Lie: It’s Alive presents sets of three cleverly-written, humorous explanations of various scientific phenomena. But, you guessed it, two of them are true and one is not. The fake one might be wildly made-up or it might have something factual embedded in it, but it’s not completely true. All the explanations are fun, but I’m bothered by young readers spending so much time reading fake stuff alongside true stuff, even if they know some of it is made up. I’m not sure about this one. 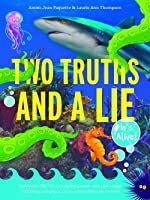 Two Truths and a Lie: It’s Alive presents sets of three cleverly-written, humorous explanations of various scientific phenomena. But, you guessed it, two of them are true and one is not. The fake one might be wildly made-up or it might have something factual embedded in it, but it’s not completely true. All the explanations are fun, but I’m bothered by young readers spending so much time reading fake stuff alongside true stuff, even if they know some of it is made up. Separating fact from fiction these days is almost a survival strategy, and I don’t quite see how this book strengthens that skill. I imagine readers being entertained and enjoying the mysteries but not remembering enough of the details the next day to be clear on what was true and untrue. I like the concept of this book, but the design was frustrating. Style like the kids' series of gross animal facts, this one is divided into sections. Each section has three editorial story's about a weird creature or natural event. Two of the stories are real and one is a fiction. ALL GREAT STUFF. But then I found it difficult to find the part of the book that revealed which one was true and which was false. The back end with the "reveal" and the bibliographies was confusing. tldr: great conten I like the concept of this book, but the design was frustrating. Style like the kids' series of gross animal facts, this one is divided into sections. Each section has three editorial story's about a weird creature or natural event. Two of the stories are real and one is a fiction. What a creative and highly readable non-fiction book! Delightful! What a great concept! I really enjoyed this book that presents three stories in each chapter along with fun facts, and readers need to determine which is the lie. Lots of uses for this in the classroom. Loved it! This is a solid piece of middle grade nonfiction with a cool premise. I like how it urges readers to do their own research and fact-checking. Plus, I mean... mind-control fungus is in this book. No better stuff for the young biology enthusiast. Fun concept for a book. I would have liked to have seen the tips for investigating the stories had come at the beginning of the book. This is a delightful read--middle schoolers are going to love it! Two Truths and A Lie: It's Alive! presents nine chapters of three stories each about plants, animals and humans where each story seems a little crazy but only one is a lie! Each story is backed up with sources and pictures and might even be sprinkled with some truths making some stories very difficult to see through. This was a very fun book to read with middle school aged children. After learning about certain topics, we would read the three stories in a corresponding chapter and have a great d Two Truths and A Lie: It's Alive! presents nine chapters of three stories each about plants, animals and humans where each story seems a little crazy but only one is a lie! Each story is backed up with sources and pictures and might even be sprinkled with some truths making some stories very difficult to see through. This was a very fun book to read with middle school aged children. After learning about certain topics, we would read the three stories in a corresponding chapter and have a great discussion in trying to decipher which story was the lie. Our favorite group of stories was the very first one which contained stories of a human-shaped root, an entire forest made up of only one tree and plant communication. The only thing that I would have prefered is if the answers were directly after each section instead of all together at the end of the book, since this made it easy to see the false story for the next section. These stories were a fun way to engage kids and have them do some critical thinking, can't wait for the next one! The introduction sets the stage for an entertaining read. Laurie and Joan have written the three segments in each of the nine chapters so convincingly that it is at times difficult to determine the falsehood. This book is a fun hybrid of fiction and nonfiction. In addition to the three cleverly written stories per chapter, Laurie and Joan expanded the fun by including lists of plant facts, plant names, animal group names, under sea creatures, animal facts, dinosaur names, strange and mysterious m The introduction sets the stage for an entertaining read. Laurie and Joan have written the three segments in each of the nine chapters so convincingly that it is at times difficult to determine the falsehood. This book is a fun hybrid of fiction and nonfiction. In addition to the three cleverly written stories per chapter, Laurie and Joan expanded the fun by including lists of plant facts, plant names, animal group names, under sea creatures, animal facts, dinosaur names, strange and mysterious medical procedures, and illnesses - all which contain one falsehood. Is a cucumber a fruit? Is it a gulp of magpies? Do vampire squids exist? Can you catch monkey pox? Is truth stranger fiction? You'll have to do some research to find out (or look in the Answer Guide provided). Especially useful to parents and teachers are the "Try This!" and "Take Action" and "Talk It Out" sections (offering ways to expand on the information), the colorful sidebar definition flags, the index, and the Research Guide. This guide offers suggested research options and the challenge to make your first reaction - Show me your source. All very valuable tools for student research and generally surviving in todays "fake news" and internet scam environment. This is a unique format for nonfiction that students will like, especially given today's climate of "fake news". I particularly appreciated the author's notes about research and factfinding. One technique for enhancing the connectedness of a group of people is to have them participate in icebreakers, activities designed to reveal information about each individual. One of these games is called Two Truths and a Lie. Participants sit in a circle with each one making three assertions about themselves. The others need to figure out which one of the three statements is false. When engaged in this contest of wits, we are able to assess body language and facial expression along with the spok One technique for enhancing the connectedness of a group of people is to have them participate in icebreakers, activities designed to reveal information about each individual. One of these games is called Two Truths and a Lie. Participants sit in a circle with each one making three assertions about themselves. The others need to figure out which one of the three statements is false. When engaged in this contest of wits, we are able to assess body language and facial expression along with the spoken words. In a new title, Two Truths And A Lie: It's Alive! (Walden Pond Press, June 27, 2017) written by Ammi-Joan Paquette and Laurie Ann Thompson, arranged using a similar format, it's much trickier to sort what is real from what is fabricated. As we read it's all about separating the possible from the impossible and reaching credible conclusions. Perfect for the classroom and browsing alike. (Much needed lessons here in spotting fake news and alternative facts). This book is such a great idea. It's really important to have kids realize that they can't believe everything that they read and that a person should fact check before just believing any story (flashback to the 'you eat a spider every time you sleep' story). Since fact checking is a critical skill to have in life I definitely support this book. Good job. This book offers a neat opportunity for honing research and fake-news-spotting skills, combined with engaging stories about weird, gross, and unbelievable science. The writing is great and even the fake stories contain some real information, making it all the trickier to identify them. A couple things make me hesitant about it: first, the book really requires some adult guidance to get what the authors intended out of it, which is to use the stories as a jumping-off point for independent researc This book offers a neat opportunity for honing research and fake-news-spotting skills, combined with engaging stories about weird, gross, and unbelievable science. The writing is great and even the fake stories contain some real information, making it all the trickier to identify them. A couple things make me hesitant about it: first, the book really requires some adult guidance to get what the authors intended out of it, which is to use the stories as a jumping-off point for independent research. I can see this being really valuable in a classroom setting or with a hands-on parent, but many kids are going to do what I immediately wanted to: read the three stories, make a guess and then want somewhere in the book to flip to and see if they're right. The book does have the answers in it, but they feel a bit buried between the research tips and the bibliography. I understand why the authors want to discourage kids from just flipping to the answers, but I'm also leery of a book I'm keeping in nonfiction that tells you up front "some of this information is false" without offering a clear place to identify which is. My second criticism is purely from a design perspective: the book is divided into nine chapters with three stories each (the titular two truths and a lie), all with colorful backgrounds and large photographs. All the bright color, however, make it difficult to tell at a glance where one chapter begins and another ends. If, say, they had made chapter one's splash pages all purple, and chapter two's all green, etc., the book would still be visually striking and easier to read in chunks. It's not that big a deal, it's just a missed opportunity for browsers. I often share that I wish I was back in the classroom, and while reading this book, I felt the same. The book contains three parts, about plants, animals, and humans. Within those parts are three chapters. And yes, more threes; each chapter shares three stories, one of which is not true, but may contain some real facts. At the back, there is a research guide for each chapter which encourages kids to discover their own “truths” through research. There is also an answer guide, a bibliography and photo credits and an index. The photos do help, but even they may be fake! In this era of fake news and fake conspiracy theories, using the book to help students learn to do research to prove a story is a goal in every classroom. Along the way, the authors have added in different parts of information with a question. For example, in the plant section, there is a highlighted box that includes ten plant names, one of which is “not true.” There are fascinating names like Sneezewort, Dinosaur Food, Butter-and-eggs and Monkey Puzzle Tree. Our Denver Botanic Gardens has a list of plants in their arboretum with interesting names. I’ve taken students there to find those plants and try to discover why they have been given those common names. It’s a great learning and engrossing activity. Sometimes a cartoon monkey in a lab coat is on a page with interesting responses to the content and sometimes there are small glossary boxes. The pages are colorfully enticing, just like the content. In this middle school nonfiction book, the authors take a scientific topic involving animals or humans, and present three outrageous stories relating to that subject. Two of the stories are true and one is false, and the hope is that kids will research to figure out which one is false. There are also several sidebars with other things kids can look up, such as true collective nouns for animals (and one in the list is fake). Some of the stories are so blatantly untrue I would really hope that kid In this middle school nonfiction book, the authors take a scientific topic involving animals or humans, and present three outrageous stories relating to that subject. Two of the stories are true and one is false, and the hope is that kids will research to figure out which one is false. There are also several sidebars with other things kids can look up, such as true collective nouns for animals (and one in the list is fake). Some of the stories are so blatantly untrue I would really hope that kids could pinpoint them without research, but others did make me think. On the downside, I found the answers easily with simple Google searches, though of course I generally can identify a reliable source, being a librarian. I did like the section at the end in which the authors give excellent advice on determining the believability of information found on a website, and I do think this could be effectively used in classroom lessons on evaluating websites and fake news. Lots of great visuals, and an extensive bibliography. I do wish they’d put the bibliographies after each story, since they advise kids to look at their sources and see if they can figure out from those which story is fake, but the bibs are after the section that reveals the true stories, so that seems kind of counter-intuitive. But if using for a class, you could fix that.